Geothermal Exploration On Nevis Is A Success! 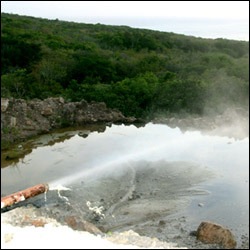 Monday June 02, 2008, marked a milestone in geothermal explorations on Nevis and in the Organisation of East Caribbean States (OECS), when the first commercially sound reservoir jetted steam from a depth of 3720 feet at the Spring Hill Nevis I site. Minister with Responsibility for Public Utilities, Natural Resources and the Environment Hon. Carlisle Powell, who was on site said he was never doubtful that geothermal energy was available on Nevis. â€œThere was never any doubt all studies said there was geothermal energy it was just a matter of finding it. â€œI am absolutely delighted that thy have been able to prove the first well as commercially viable. Of course there is still a lot of work to be done before we can turn this steam into electricity but I am confident that West Indies Power (WIP) and its subcontractors are doing the right thing,â€ he said. Meantime, Chief Executive Officer (WIP) Mr. Kerry Mc Donald, told the Department of Information of the significance of the find. He cited that it was a sustainable reservoir with an approximate temperature of 480 degrees Fahrenheit which had enough energy for a geothermal power plant. â€œThe significance of this is that at 3500 feet we hit a small fracture and we developed that small fracture the same as this. To develop that fracture we took out the drill bit so we had an open pipe that we were using to develop it. That took 20 hours to develop about 1/20 of this amount of steam. We went down 200 more feet at basically 2:30 we started to develop this [and] at 3:30 the steam came out. The drill bit is still in the pipe so in other words what you are seeing is steam coming around the little cracks between the drill bit and the pipe wall so this pipe is not open. All you are seeing is whatâ€™s coming around the sides, so if we opened this pipe it would be flowing about five times more than this. â€œWe feel all the water we use to drill with, will be out of this in roughly 30 hours and we will have nothing but the pure steam. What this says is we are in the reservoir.Â This is a sustainable reservoir and this is enough to build our geothermal power plant,â€ he said. Mr. Bobby Tinsley Drilling Supervisor of Therma Source, a sub contractor of WIP explained that a series of tests would be conducted and sent to the laboratory and the relevant data collected on the reservoir. â€œWhat you are seeing is the steam that is actually coming out of the well and the hot water. The water is getting hotter, we anticipate 24-36 hours of development to get to the background fluids where we can run samples and send them off to the lab. We will do chemistry ph control right now the ph is about 6.7 which means we are very close to fresh water non acidic and we plan on doing this for about three days to make sure we get the background waterÂ and get the data that we need. So it would be very exciting. â€œWe are basically in the reservoir now. What we have proven is the reservoir is there. The exploration rig is not designed to go through the reservoir. What it is designed to do is find the reservoir and find the top of it and test the chemistry of the water and thatâ€™s what we are doing at this point. We will probably be done with this well when the testing programme is over. We will let it set so we can get thermal gradient of the formation for about 30 days and then do some more tests on it but we will probably be moving off Nevis I and headed to Nevis II,â€ he said. At present Nevis consumes a total of 10 mega watts of electricity and based on the initial assessment each well will produce an estimated 10-15 mega watts of power.